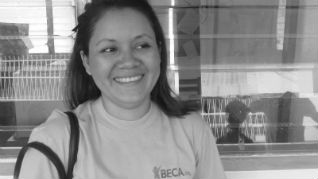 María Luisa Torrez - Accounting - BECA. The BECA.org Foundation. Empowering Youth Education in Nicaragua. Hello, my name is Maria Torrez. I am part of BECA.org family. I will tell a little a bit about the souvenirs and blessings I got being part of this wonderful family. Just 6 years ago I entered to BECA.org it seems it was yesterday, I could know about this foundation since my brother told me that there was a foundation which helped a lot of poor young people. You might be wondering how I got into BECA.org, well it was pretty easy I just took my documents to BECA.org, and went through to the whole process. BECA.org asked me for a letter in which I had to write why I wanted to study accounting because that was something that I wished. I passed through Curse 1, and I got 92 out of 100, so it was a very good scoure, I was highly proud of myself because I got the chance to choose one technical career, but before I chose my technical career my friend and I went to different academies to select one and study there. When I was coursing my career I met one of sponsors Bryan Alvo who I owe what I have today, maybe he thought I would not be able to finish or complete my technical career I do not why I write this, but that is what thought at that moment. Later I finished my accounting course, and I went to do my practices to a company in Granada that is called CECA where I learned many things. I remember having very good times with my partners. Once, we went to Sabana Grande, and we had to walk 7 kilometers to get a health center and clean it, it was a memorable and exciting day that I had being in this foundation. Besides the technical career I got I made very good friend that I still keep in touch. Nowadays, I am working as teenagers tutor in foundation that helps kids and young people that are in poverty, I mean, they do not have the chances to study by their own, I talk to them about Jesus Christ because I know he can help us to get whatever we want since due to him we have known people like Walter, Bryan, and all the sponsors that have helped us to build our future. In this foundation all my coworkers and I teach different things such as bakery, English, music, etc. What I love about this place is that always I got a lot hugs that come from my students they all are nice and kind since we are teaching them how to respect others, and I think I am helping my country on that way. So I would like to thank God first and then to all sponsors that made my dreams come true…Thank you so much for everything.